It can be hard to keep crumbs and goo away from your keyboard in the real world. We all tend to want to use the computer while we eat at some point and crumbs end up in the keyboard where they can cause issues with typing. If you want to prevent that from happening, you need to either keep your machine away from food or get a keyboard cover of some sort. iSkin makes all sorts of protective covers and cases for gadgets. 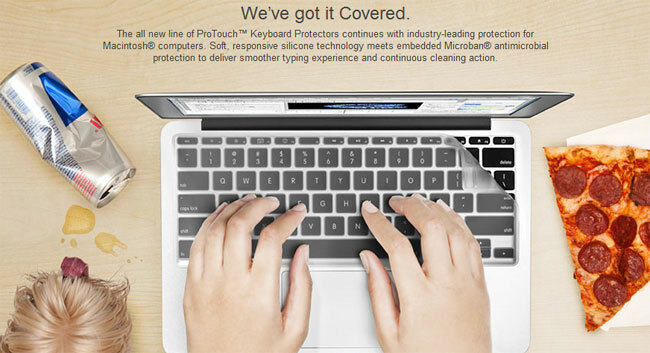 The company has announced that it is now offering the ProTouch Classic for the 11-inch MacBook Air. The new keyboard cover fits the Air perfectly and is clear. It will keep goo from getting goo your keyboard and should help keep the letters from wearing off the keys over time. The keyboard cover is also infused with Microban to kill germs and help keep you from getting sick, keyboards are germ-infested places. The cover can be removed easily and cleaned if needed with running water rand soap. You can buy one now for $24.99.